Food Blogga: Forget Food Trends. What Will YOU Be Eating in 2012? Forget Food Trends. What Will YOU Be Eating in 2012? Yahoo News and the Food Channel predict the rise of Peruvian food in 2012. "No chance," counters Esquire's John Mariani, who claims that beyond ceviche, "there's not a helluva lot more to Peruvian cuisine." Meanwhile, The James Beard Foundation (JBF) predicts a Thai food "revival," while Fox News says it'll be Moroccan and Jewish foods. The new "it" dessert of 2012: the humble doughnut. That is, according to the JBF. YumSugar thinks it's going to be kouign-amann, a buttery French cake. My money's on doughnuts for this one. Who is ever going to know how to spell or pronounce "kouign-amann"? I mean, really, come on. A few more predictions for the hottest food trends in 2012 include unusual pizza toppings (cardoons, anyone? ), exotic seafood (uni), and more animal parts (bone marrow, tripe). These folks really shouldn't stress about being right. Because when December 2012 rolls around, they'll all be writing articles about the actual hottest food trends of 2012, and it won't matter if their December lists are completely different from the January ones. I'm not too interested in predicting this year's food trends, but I am interested in learning about what foods YOU'll be eating of 2012. Below you'll find eight foods I'll be eating more of in 2012 not because they're trendy, because they're delicious, healthy, and easy to cook at home. How about you? Which foods do you intend to eat more of in 2012? How do you feel about food trends? 1. Almond Milk: Since I'm lactose-intolerant, I've been drinking soy milk for years, but lately I've come to love unsweetened vanilla almond milk. A mere 40 calories per cup, its nutty, mildly sweet flavor makes it ideal for breakfast smoothies. How to enjoy: Use in place of milk in smoothies, oatmeal, and other recipes, such as pudding. Sample recipes: Cranberry, Banana, and Honey Smoothie and Mom's Chocolate Pudding with Bananas and Graham Crackers. 2. 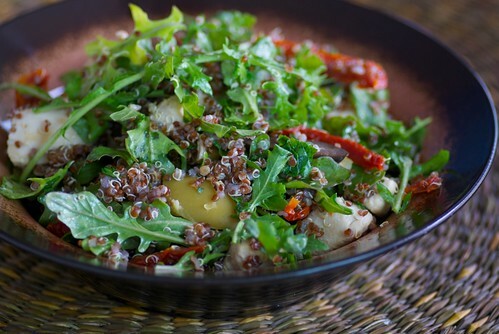 Red Quinoa (pronounced KEEN-wah): Because it's a gluten-free, high-protein, remarkably nutty, chewy, versatile whole grain. And because it's red. How to cook it: Boil -- follow instructions on package. 3. Leafy Greens including Kale, Red Kale, Mustard Greens, Swiss Chard, Collards, Turnip Greens, and Spinach. You see them at the market, pick them u[, wonder what to do with them, then put them back. Don't! Saute them with olive oil and garlic; add them to soups, stews, pastas, and grain dishes; eat them raw in salads. On average, 1 cup of cooked leafy greens without salt ranges between 35-45 calories and contains between 2-6 grams of protein. How to cook them: Boil; steam; saute; roast; raw in salads. Sample recipes: Raw Greens, Apple, and Carrot Salad with Warm Maple-Mustard Vinaigrette and Easy Butternut Squash, Kale, and Chickpea Soup. 4. Kabocha Squash (pronounced kuh-boh-cha). Because its sweet, fluffy orange flesh tastes like a sweet potato. Because it's only 30 calories per cup. And because you're tired of buying butternut squash. How to cook it: roast; steam; boil. 5. Scallops. Among the least "fishy" of seafood, scallops are usually liked by everybody at the dinner table. That's a good thing since 4 ounces of scallops are only 125 calories and boast 28 grams of protein. They also pair well with just about any type of vegetable from roasted spaghetti squash and sweet potatoes to sauteed escarole and spinach. How to cook them: Pan-sear or bake. 6. Pork tenderloin. It's inexpensive, easy-to-make, endlessly versatile, and healthier than you might think. An average 4-ounce serving of pork tenderloin is 195 calories, 25 grams of protein, and 9.5 grams of fat. How to cook it: Pan-sear, then roast in oven; grill. 7. Grass-Fed Ground Bison/Buffalo. I love ground beef burgers and meatballs and don't plan to stopping eating them, but I will be introducing more ground bison into my diet in 2012. Why? It's got a fresh, robust meat flavor, sort of like a souped-up steak burger, and it's lower in fat, calories, and cholesterol as compared to ground beef. A 3.5 ounce serving of 95% lean ground bison is 146 calories, 20 grams of protein, and 7.2 grams of fat. How to cook it: Pan-sear; oven bake; grill; broil. 8. Almonds:While some women's purses contain hair brushes and coupon holders, mine contains a Ziploc snack bag of about 14 roasted, unsalted almonds. I can't tell you how many times that bag of almonds has saved me from a hunger attack while waiting in line at IKEA or Costco. And at only 100 calories, it beats the heck out of a Swedish meatball plate or slice of pizza. How to enjoy almonds: As a snack; mixed with dried fruit; baked into muffins and breads; swirled into oatmeal and yogurt; tossed into salads, pastas, and whole grain dishes. Sample recipes: Warm and Nutty Breakfast Couscous and Cherry, Prune, and Almond Granola. Top photo credit: FFC, San_Drino. One food I intend to eat more of this year is lentils. They are so versatile and healthy, and I only recently discovered that I do, in fact, like them. I like your trends! To get extra greens in I add spinach to smoothies. It turn it green, but you don't taste it at all! I'm also focusing on eating less meat in 2012, so I'm coming up with some new ways to get my protein using lentils, tempeh, and tofu. julie-I love lentils too. I always make them in soup but forget how good they are in salads and burgers. laura-I haven't found a green smoothie I'm compatible with YET! But I plan to keep trying in 2012. I eat meat, but I really love tofu and tempeh and plan to keep incorporating them into my meals. Great ideas. I'm going to try eat more fish, or maybe I should say be more adventurous when it comes to cooking it. I love all kinds when I eat out, but at home it's usually just salmon, haddock and mackerel, so this year I'll hopefully attempt cooking some other varieties. Great list! I am interested in your comments about almond milk. I started using light vanilla soy milk this year for coffee so I may have to try almond milk and see if I like it better. I just tried almond milk for the first time this week and red quinoa last week. Too funny! We've definitely been eating a lot more pork too... esp. 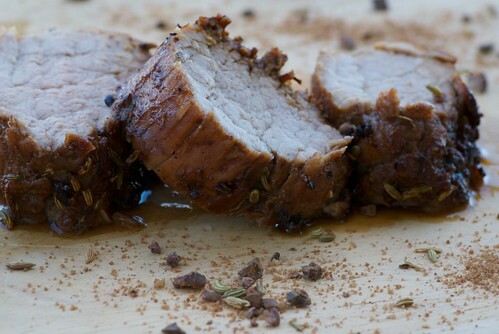 pork tenderloin. Great list! I actually have a post coming next week about foods I want to eat more of this year. For the almond trend, try cocoa roasted almonds made by Emerald. I just recently discovered these and they are delicious and still healthy because they're roasted in cocoa, not covered in chocolate. It's my "go to" when I need a sweet fix. slyvie- I usually make tilapia and shrimp. But this year I'm going to add more seafood including mussels, mahi-mahi, and smoked trout. kalyn-When I first tried almond milk, I found it terribly bland. Then after the first week, I grew to really like it. Now I drink both almond and soy milk. I find almond milk less sweet than soy milk, so it's a personal preference. megan-Let me know when your list is out! I also have dark leafy greens at the top of my list. I love beef but I've already begun to cut back, and I plan to continue that. And, because it's on your list, I have to try almond milk. We are so in sync it's insane! I'm NOT lactose intolerant but only drink almond milk. I LOVE leafy greens...make sure to get at least one serving a day! 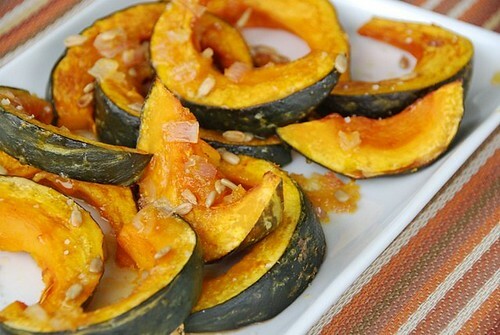 Kabocha is my go-to winter squash and almonds are my go-to snack! I plan on eating more beans in 2012. And more cabbage. gloria-Sounds like you're doing a wonderful job! You're eating lots of low-glycemic foods which are super healthy. And the addition of the flaxseed meal is so smart. Thanks for the reminder! It makes me so happy to hear that you look forward to your meals. I think many people have the misconception that healthy eating equals boring or tasteless eating. Cheers to a healthier, happier 2012! lydia-Yes, I hope you give almond milk a try. It's a regular in my lineup now. joanne-Why am I not surprised? I eat a lot of beans of beans, but I have to say, other than cole slaw I don't eat much cabbage. That's a good suggestion! I'm going to work/cook/eat my way through your list. I will be joining you in just about everything but pork. Because, well, I'm Jewish :) But everything else is high on my list! Actually I do fancy a doughnut. So doughnuts it is! I actually LOVE quinoa! I think I am going to be making more dishes with it in the coming year! I find it as satisfying as rice but you can eat a lot of it without having to worry about your body storing extra glycogen from the carbs if you eat to much so quinoa it is! Top on my list for 2012 is purple sweet potatoes. I already started growing my slips. Then come tofu, leafy greens, quinoa, nuts all kinds, winter squash, whole grains, dried beans, lentils, oh my, I have a long list. More grains like quinoa are on my list (bought a bag of the red stuff last year and loved it) as is getting more fish in my diet...which will be the hard part for me as I'm not fond of cooked fish. And you are right about the kouign-amann. It's having a bit of a renaissance here in SF (and, I hear, in NY), but middle America is never going to be able to collectively grasp the idea of it. It isn't all that hard to pronounce (I swear! "Queen a-MON") - but it definitely isn't a cupcake or a donut.